In order to shoot your film, you’ll need to pack the following: your camera, extra batteries, lenses, shoulder rig, extra cards, a microphone, and... a door wedge. Yes, this video is all about why you should include a door wedge in the essential equipment you take to a shoot. A door wedge was something I didn’t know I needed in my camera bag until we were on set shooting our latest short film The Asylum Groove. The shot was 1L, a medium close up of Sam, our main character. He walks into the frame and starts to mop. The shot was low down so we could not use a tripod. Instead we rested the camera on the handles of the shoulder rig so the camera would have a steady point to rest on and not be too shaky. This worked great, but the shot wasn’t level. So I asked the camera team if there was anything we could stick underneath to make it level. Adam Opie, the 2nd AC on the film, handed me a door wedge which was the perfect tool for the job. I was able to incrementally tilt the camera until it was level. After this epiphanny, we went out and bought a few door wedges, and they have been coming in handy for lot of different setups. Sometimes in the studio, when presenting, we can’t always fit a tripod into a corner, so we build up some boxes then use a lens cap or some paper to tilt the camera up to get the correct angle. You can never get the lens cap in the right position, but the door wedge has solved that problem. On set, the door wedge can also be used to help level out a track. You possibly may need a few wedges depending on how long and the type of surface you’re building the track on so making them out of wood will be your cheapest option. If the chair your talent is sitting on is wobbly, you can use a wedge to solve that problem as long as it is not in shot. And finally, if you have a shot of a character walking through a doorway, you can use the door wedge to keep it open. It’s the right tool for the job. 🚀http://bit.ly/tflrs-creator - Become a social media powerhouse with RocketStock's video element pack, Creator. This collection comes packed with logo reveals, end screens, subscribe animations, and much more. 🎵 http://bit.ly/track-phenomenal - Click here to download this episode's track. Check out Premiumbeat.com to discover a huge range of exclusive royalty free music! One thing we can get wrong is NOT utilizing dialogue to its full potential. It's easy to write on a page but can be difficult to get sounding great. I don’t think it's because of any lack of creativity or imagination - I think we may simply be approaching dialogue from the wrong angle. Dialogue is MORE than just a tool for exposition. “Show don’t tell” is a trick used in writing to force ourselves to find a visual way to give audience information without resorting to lines of dialogue. Instead of Jimmy shouting “I’m so angry, Mindy!”, have him smash a plate. No lines - all visual. If you apply this rule to your writing, you now have a vacant space where the dialogue used to be. This gives you the opportunity to use dialogue to demonstrate character traits. If you think of dialogue as a tool to open up characters, they actions, and better yet their REACTIONS to statements and questions, it starts to open up a lot more opportunities to see who a character really is. Let's go back to Jimmy in the kitchen. Originally we had Jimmy’s line, “I’m so angry, Mindy!”. Then we found the action in that line, ANGRY, and replaced the dialogue with an action, “Jimmy smashes a plate on the floor.” It shows us his anger. Let's add a line back in before he smashes the plate. Smashing the plate shows us his emotion. So we can use a line of dialogue to further unravel his relationship with Mindy. 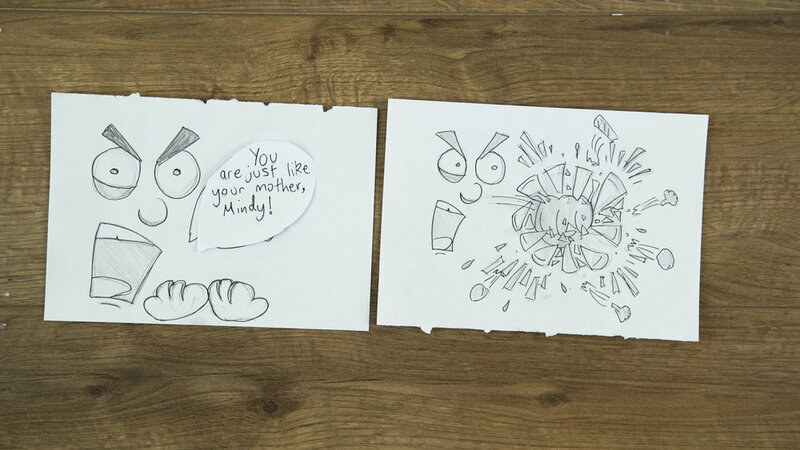 Jimmy: “You are just like your mother, Mindy!” Jimmy smashes a plate on the floor. With a line like that, we are given information about their relationship dynamic. 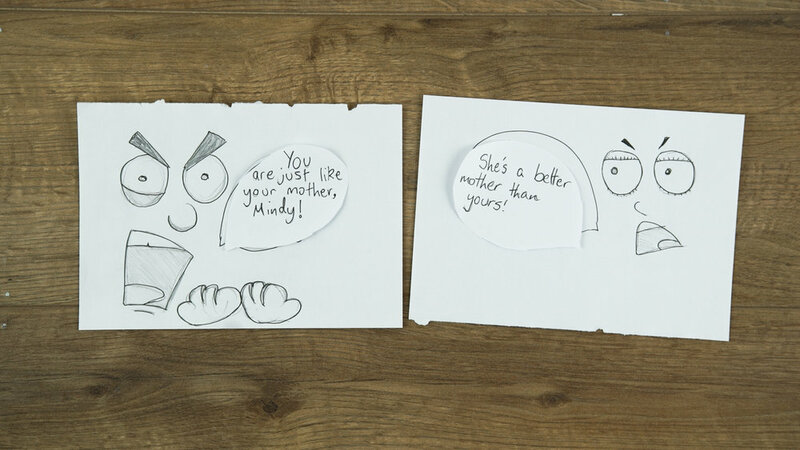 “You are just like your mother, Mindy”: this signifies Jimmy’s distaste of Mindy’s mother. It also shows that Jimmy is starting to see traits of Mindy’s mother in Mindy. He is now perceiving her in a different light. A line like that could also tell us that Jimmy has been holding in this feeling as he expresses it during a moment of anger, so maybe Jimmy keeps most of his feeling to himself. But we can go one step further! Dialogue is not JUST delivered. It is also received. There are AT LEAST two people in a conversation. So we can show two sides of a conversation using the delivery of a line and the other person’s reaction to the line. Dialogue is ACTIVE then REACTIVE. “You are just like your mother, Mindy!”...Mindy could then say something like “She’s a better mother than yours!” which gives us the impression that Mindy doesn’t like Jimmy’s mother but also that she is the type of person who isn’t afraid to say what she is feeling. “You are just like your mother, Mindy!”....Mindy then responds “Oh my god. You’re right.”. So in this instance she has realised she has messed up, and is able to perceive her attitude. But we can actually use the rule “Show - Don’t tell” here! Instead of the line “Oh my god. You’re right”, she could simply freeze from the conversation, give a moment of stuttering dialogue, but then hold back and drop her eye contact with Jimmy. Once you start to think of dialogue as being an element which can be received and not simply delivered, you are increasing the opportunities for developing a character’s personality. One last thing: The reaction to a line of dialogue doesn’t always have to be the clean-cut correct answer. Misinterpretation is something we can include to give dialogue more realism. Mindy says the line “You shouldn't be sleeping on the sofa anymore”. The reaction to this by default be may that she is inviting Jimmy to sleep upstairs again and she wants to resolve the situation. But let's play the scene out. Mindy: “You shouldn't be sleeping on the sofa anymore”. Mindy: “No, you need to move out.” This adds a bit of a twist to the conversation and confirms her ACTUAL interpretation to that line. Obviously this is a very simple scene with some super basic one dimensional characters, but hopefully that gets the point across. Try to find the emotion in a line and replace it with action. Then think of the REACTION of a line as a way to show character traits. If you want dialogue to sound more realistic, try having the characters NOT QUITE understand the question or statement, and then have them confirm the real answer. 🎵 https://bit.ly/track-blue-lounge - Click here to download this episode's track. Check out Premiumbeat.com to discover a huge range of exclusive royalty free music!